With all due deference to Bill Murray, to hell with Groundhog Day. Spring doesn't begin six weeks after some rodent sees his shadow (or doesn't-we can never remember.) Spring starts tomorrow. For tomorrow is when pitchers and catchers report to Port St. Lucie for spring training and, quite obviously, you can't have spring training until it's spring. It's cold and miserable here in New York, but spring training is a state of mind, not a state of being. It's the sound in the air of roller skates on pavement, the first morning when you don't wake up with your nose cold, or the walk to the subway that doesn't get you down, but brings you up. It's when you notice that pretty girl in the elevator who smells like, well, a pretty girl in an elevator. It's when a guy decides to put a silk in his breast pocket because he's not wearing an overcoat and maybe, just maybe, that pretty girl in the elevator will notice him this morning. still do, at the process. The great baseball announcer, Harry Caray, said it well: "It's the fans that need spring training. You gotta' get ‘em interested. Wake ‘em up and let ‘em know that their season is coming, the good times are gonna roll." After, at spring training, hope is the eternal motivator. "You know," Harry would promise, "they're not going to lose 162 consecutive games." In a case with which we have some familiarity, the Court of Appeals last week dealt with the offensive use of the rules of ethics and the vagaries of punctuation. In Marin v. Consitution Realty, LLC, 2017 NY Slip Op. 01019 (2/9/17), the attorney of record hired experienced co-counsel to help her in the pre-trial stages of this Labor Law case. She agreed to pay him 20% of any attorney's fee. Concerned that he was becoming too involved (and perhaps might purloin her client,) she redrafted their agreement to limit his contact with the client, but never reduced the 20% fee arrangement. Finally, the attorney of record discharged her co-counsel and suggested that he be satisfied with a quantum meruit arrangement at the end of the case. He did not agree. case settled for $8 million, the die was cast for an epic fee battle between the attorney of record and her two co-counsel.This week, that battle ended in a split decision. The Court found the first co-counsel, who had agreed to take 20% of the attorney's fee, was entitled to just that. The agreement was clear and had been twice drafted by the attorney of record. Arguing that co-counsel had failed to notify the client of his retention, as required by RPC 1.5(g), fell on deaf ears. The use of the ethical rules as a sword for the lawyer, rather than a shield for the client, unavailing. After all, the attorney of record had also directed her counsel not to contact the clients directly and it was she who also had a duty under Rule 1.5(g) to notify the clients, and led her colleague to believe it was done. However, as to her other co-counsel, the attorney of record prevailed, and was ordered to pay him only 12%. The words of their agreement were not the picture of clarity. Did the mention of the mediation, to be held on a specific date, mean that if the case did not settle on that specific date, co-counsel would be entitled to the 40% retainer rather than the 12% retainer? The Court holds that mentioning a specific date does not require that the mediation be be concluded in a single-day session, nor even be limited to the date specified. 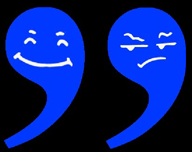 Citing to Strunk & White, the ultimate authority on matters of punctuation, "the use of commas indicates that the date was merely descriptive of the mediation and not intended to restrict the mediation to that date." The 40% fee could only be triggered by moving past mediation.